Preheat oven to 350 F and grease a standard loaf pan. Whisk together eggs, sugar and butter in a large bowl. Sift in the dry ingredients and stir well to combine. Add the nuts, fruit, vanilla and milk to the batter and mix well. Pour the mixture into the prepared loaf pan. Set the loaf pan in a casserole or baking dish and fill with warm water until it reaches halfway up the sides of the loaf pan. Bake for 1-1 1/2 hours or until a toothpick inserted into the center comes out clean. Set loaf pan on a wire rack to cool before turning out loaf. 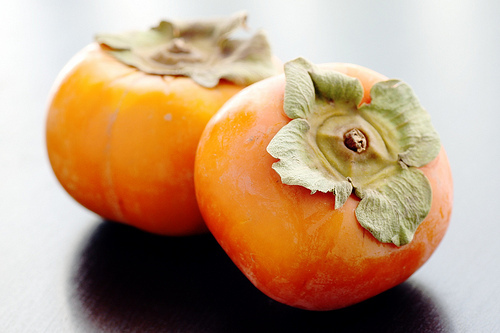 Persimmons are a classic autumn fruit. They taste almost like a mango dusted with cinnamon and the texture can range between mushy pudding, a firm tomato or as crunchy as an apple if not yet ripe. 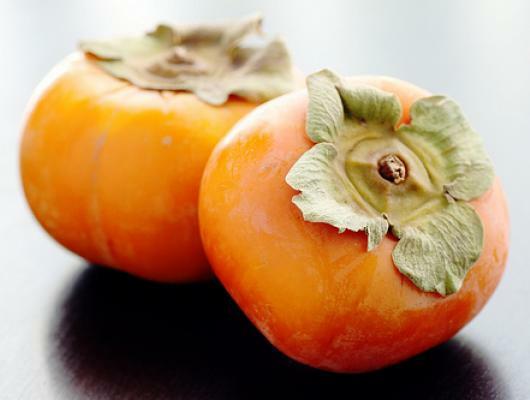 The key to purchasing and cooking with persimmons is selecting the right type -- generally, there are two types available: fuyu (non-astringent) and hachiya (astringent). Fuyu persimmons are round and squat like a tomato and are perfect for peeling and eating, baking, whether they are firm or quite soft. Hachiya persimmons, on the other hand, are heart shaped and "taller" than fuyu persimmons and are inedible until they are quite ripe and soft! Enjoy this bread for breakfast or a healthy snack with apple butter, pumpkin butter or your favorite preserves! Dairy Free Option: You can easily substitute non-dairy butter (like EarthBalance) or margarine and non-dairy milk (soy, rice, coconut) in this recipe with amazing results! Click here for the Persimmon Pulp Recipe.